Censorship’s not a new thing by any stretch, and when your work is deemed ‘subversive’, it’s safer to amend it rather than risk prosecution. 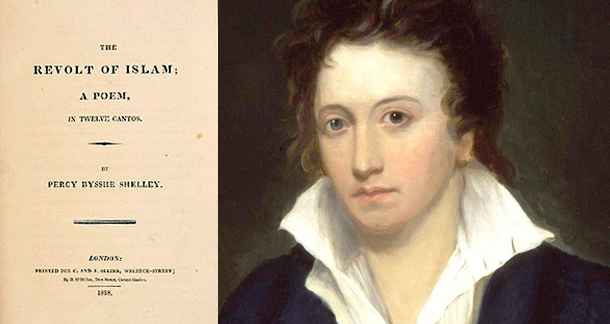 The recent discovery of an original print of Percy Bysshe Shelley’s epic poem The Revolt of Islam suggested to Nora Crook and Stephen Allen that someone besides the poet made changes to it. We know quite a bit about the events around the poem as it was well-documented. Originally entitled Laon and Cythna, and coming in at nearly 5,000 lines of “Spenserian stanzas”, it was revised when Shelley was urged by his publishers, wife and friends while at his house in Great Marlow in December, 1817, to alter some of the poem’s anti-religious theme as well as its incestuous content. Publication would have led to prosecution for blasphemous libel for the printer and Shelley’s publisher, Charles Ollier. Shelley duly agreed to alter the objectionable passages. The title was changed and the poem republished. The changes, mostly in Shelley’s hand, are preserved in a copy of Laon and Cythna that can be found in the Morgan Library and Museum in New York. But the recent discovery acts as a missing link between the unexpurgated Laon and Cythna and the Morgan copy. Analysis of the marks on the copy suggests that someone other than Shelley, who was present at Great Marlow on December 15, wrote the suggestions that were then incorporated into the final text. But who? Crook and Allen believe Shelley’s friend and neighbour, Thomas Love Peacock, did the actual censoring and the poet was an ‘unwilling’ contributor, going against previous claims. And as Peacock was an established poet, he was probably the only one Shelley would allow to make the changes. Whoever made the changes, it managed to avoid any trouble with the law. I guess we’ll probably see the unexpurgated version in publication before long, but we’ll see what kind of response it gets. It probably wouldn’t have changed history, but was it worth it? I guess we may never know.